Anglers come from all over the world to fly fish in Bozeman, Montana. Our professional fly fishing guides have made it their home. At the Montana Angling Company, we have made it our base for custom fly fishing trips. There are lots of great reasons to find yourself in Bozeman, but for fly fishing anglers, it is the many rivers and streams that call us to Bozeman, MT above all else. There is no other place that anglers can fish more miles of a great variety of blue ribbon water, on any given day, than Bozeman. Just mentioning the names of the more famous waters around anglers is sure to conjure up ideas of fly fishing adventure. Whether you are a novice angler or well-seasoned river veteran, there is a river for everyone in Bozeman, MT. And our custom fly fishing trips are designed to find the perfect water for you. The Gallatin River truly is the local favorite. The main stem runs just west of town, the East Gallatin River just to the north, and its many smaller tributaries all through the surrounding valley, the Gallatin Valley. This blue ribbon river offers blue ribbon fishing from its headwaters to its end at the headwaters of the Missouri River near Three Forks, MT. The Gallatin River changes dramatically several times over its course, but offers anglers everything from meandering meadows, to rocky canyon pocket water, to long gliding runs through Montana’s open prairie. This is classic freestone fishing at its finest. Great hatches throughout the year make for consistent dry fly fishing for wild trout. Our fly fishing guides generally wade-fish the upper reaches and float fish the lower stretches. Great public access is available along its length as it parallels Highway 191, but becomes difficult to access without floating downstream of the confluence with the East Gallatin River. The Yellowstone River offers anglers in Bozeman, MT the finest big river freestone fly fishing experience in the state of Montana. In many ways the Yellowstone River is the perfect trout stream. It hosts great populations of wild trout, offers great hatches from March through November, and offers enough diversity because of its length and flows to offer anglers a new experience each time they fish it. The Yellowstone River at early Summer flows around 12000 CFS is a very different river than the Fall flows below 1200 CFS. And its character changes dramatically from Gardiner, MT to Big Timber, MT. If you want whitewater, there is whitewater. If you want cutbanks, there are cutbanks. If you want easy going, sweeping bends, there are plenty of those too. And lots of great trout. The wild rainbow, brown, and cutthroat trout of the Yellowstone River seem to always be on the feed, making for consistent angling opportunities throughout our season. Runoff and winter hit the Yellowstone River hard, but if the Yellowstone is clear and ice-free, you can almost always count on the trout to be rising. And our Yellowstone River fly fishing guides somewhere nearby. Almost every fly fishing angler in the world has heard of the Madison River. It is one of Montana’s greatest treasures and there is no other river quite like it. The Upper Madison River runs, fast, clear, rocky, and shallow from its headwaters in Yellowstone National Park to its eventual end at the headwaters of the Missouri River. To the untrained eye, all of the water often looks the same. But to the trout each rock, dive, bend, and drop is some of the finest trout habitat in the west. The Madison River boasts some of the highest trout per mile numbers in the state. The many annual hatches keep the trout on the feed nearly year-round. The salmonfly hatch brings in anglers from all over to fish these hallowed waters. Can’t miss fly fishing. There are many great ways to fly fish the Madison River and everyone has their favorite. Dry flies, nymphs, and streamers all produce over the course of a season. Wade fishing rules early season and late season, whereas float fishing is our choice during the summer months. Cold, clean water and great trout fishing, all season long. The Mighty ‘Mo seems to spoil every angler that comes to fly fish. Simply put the Missouri River offers the largest average size wild trout of any river in the state. And lots of them. This doesn’t mean the fishing is easy, but safe to say the odds are in your favor. The Missouri River has been described by anglers as the worlds largest spring creeks. The dynamic hatches, large pods of rising fish, and consistency make it a favorite all year round. The Missouri River is where you will find our guides most days from mid-April through June and once again in October through November. The big summer hatches of PMDs, caddis, and tricos are the main attraction, but anglers can count on great fishing all season long. We primarily fish the tailwater stretch below Holter Lake, but our fly fishing guides also fish the freestone stretch from the headwaters to Canyon Ferry Lake during the shoulder seasons. And occasionally during the summer to target carp. Many anglers ask us why it would be worth paying an access fee to fly fish a stream in a state with so much great public access. Simply put the fly fishing on the Paradise Valley Spring Creeks is a unique experience that truly is priceless. DePuy’s, Armstrong’s, and Nelson’s Spring Creeks all offer anglers in Bozeman the opportunity to experience some of the finest technical dry fly fishing around. Thick hatches of mayflies, caddisflies, midges, and terrestrials move through the creeks, varying with the time of year, and make for excellent sight fishing in a world class setting. The ranches these creeks flow through are all historic, working ranches that just getting to spend a day exploring would alone be worth the price of admission.These creeks afford Bozeman anglers fishing with our Bozeman fly fishing guides year-round opportunities to wade fish. Hard to find winter time fly fishing in Montana better than what you’ll get on the Paradise Valley Spring Creeks. We consider ourselves lucky to be able to consider Yellowstone National Park a part of our backyard. 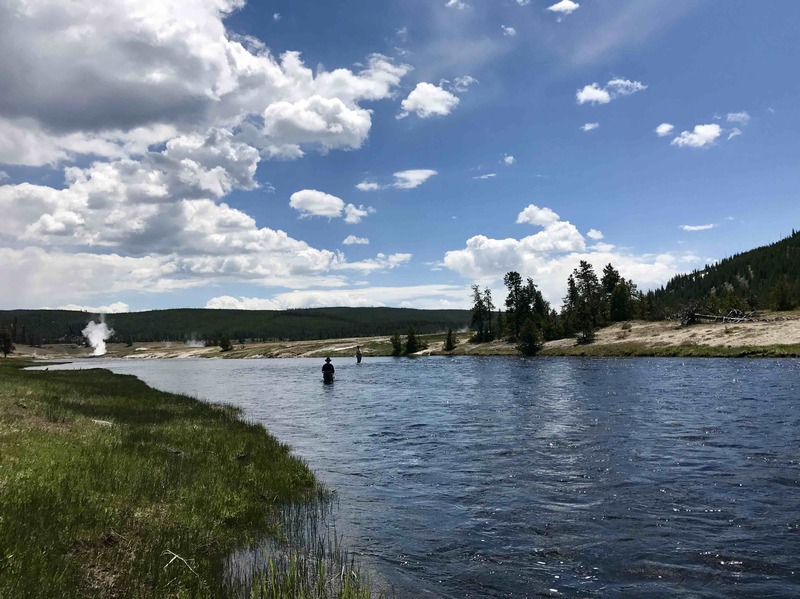 The north and west entrances to Yellowstone are just a short, scenic drive away from town, and anglers will be happy to find some of the finest trout streams in our area within the Park boundaries. The fishing season in Yellowstone runs from Memorial Day weekend until early November. And it would be hard to think of a better place to wade fish for wild trout during this time. Early season means fishing the western rivers for Bozeman based fly fishing anglers. The Madison River, Firehole River, and Gibbon River are some of the first rivers to clear in our area. By mid-summer most anglers head to the north east corner of Yellowstone to fly fish the Yellowstone River and its many tributaries in pursuit of native cutthroat trout. The Lamar River, Soda Butte Creek, and Slough Creek are some of the best mid-summer options for anglers headed that way. Bring plenty of hoppers, ants, beetles, and other small terrestrials: it is hopper fishing heaven. Bozeman anglers often overlook the Jefferson River when coming to fly fish, but the ‘Jeff is a fine trout fishery in its own right. The Jefferson River does not have as many fish per mile as many of our other blue ribbon options, but what it lacks in numbers it makes up for in scenery and character. If putting 50 fish in the net is your primary concern during a day of fly fishing, then the Jefferson River is not for you. But if you like fishing a smaller river with little angling pressure, in one of the more scenic of the many river valleys in our area, then a day fly fishing on the Jefferson River would be a day well spent. Mid-summer flows are generally low so it is best to fish the Jefferson River in the spring before runoff and again in the fall, and anglers can expect success with dry flies, nymphs, and streamers. Rainbow and brown trout dominate the Jefferson River and while catch rates are generally lower than other rivers, there are some great fish to be found. Access is limited to Montana fishing access sites and bridge crossings, making the Jefferson River a better float fishing than wade fishing option. What anglers can expect on the Stillwater River: fast water and equally fast-paced fly fishing. Nothing “still” about it. The Stillwater River pours out of the high Beartooth Mountains and rips and roars along its course down to its confluence with the Yellowstone River. Floating the Stillwater River is not for the faint of heart. Our Bozeman fly fishing guides that take anglers on the Stillwater River are all experienced whitewater rowers and use high-performance rafts with fishing frames to navigate the rough waters of the Stillwater River. Lying in wait between the many rapids of the Stillwater River is some of the finest blue ribbon trout water in Montana. The wild cutthroat, rainbow, and brown trout of the Stillwater River are voracious feeders, ready and willing to eat a well presented fly. At higher flows this is classic pocket water flyfishing at it’s finest. At lower flows the middle of the river opens up, as do wade fishing opportunities. Public access on the Stillwater River is great with many fishing access sites and forest service land access on the upper river. The Boulder River lies just south of Big Timber, MT, a short drive from Bozeman, MT and offers anglers great fly fishing on a smaller river, in truly spectacular setting. The Boulder River is swift and rocky, so early season floating is best left to experienced whitewater rowers, but low summer flows generally lend the river to wade fishing. Head above Natural Bridge State Park for virtually unlimited access to miles and miles of blue ribbon trout water. As its name suggests, the Boulder River is littered with bigger rocks and boulders which makes for difficult wading, but the great fly fishing often makes up for the tough wading. Anglers can expect to catch rainbow trout, brown trout, cutthroat trout, and brook trout along the length of the Boulder River. While the wild fish of this river are not known for their size, their eagerness to rise to a well presented dry fly is second to none. Anglers can expect to fish with dry flies most days during the summer months, but nymphing and streamer fishing can also be effective and keep the bite alive during the shoulder seasons. Our professional fly fishing guides use high-performance rafts with fishing frames and have the whitewater rowing experience necessary to make a day of fly fishing on the Boulder River fun and safe for our anglers.